The moon is like an aging boxer, its face scarred and distorted by a lifetime of powerful blows. In the boxer's case, those blows are delivered over the course of a few decades. In the case of the moon, the punishment has been going on for billions of years, courtesy of comets and asteroids that have carved out craters and piled mountains all over the lunar surface. The very birth of the moon was violent: planetary scientists are pretty sure our companion world was created when a Mars-size object slammed into Earth and ripped off a moon-size chunk. Much of our understanding of that violent history comes from rocks hauled back by the Apollo missions four decades ago. But the astronauts who gathered that evidence literally just scratched just the surface  and many of the moon's secrets are buried far deeper. See the Hubble telescope's greatest hits. That's why the GRAIL mission, which successfully inserted itself into lunar orbit over the New Year's weekend, is so crucial. GRAIL, the Gravity Recovery and Interior Laboratory, will be probing deep beneath the moon's surface to analyze its interior structure in unprecedented detail. Since that structure reflects how the moon was originally formed and the violence done to it since, GRAIL will fill in all sorts of blanks about our satellite's birth and evolution. That's the what, but it's the how that's so ingenious and that deserves a bit of explanation. GRAIL is not one but two identical satellites that will orbit in tandem, 35 miles (55 km) above the surface  GRAIL A in front, GRAIL B following tens of miles behind. If the moon were simply a featureless, homogeneous sphere of rock, the distance between A and B wouldn't change. The moon isn't featureless, though: in some places there's extra stuff piled on the surface like mountains and crater walls, and in others there are gaping pits  the craters themselves. When GRAIL A approaches a mountain, the peak's extra gravity pulls on the probe, making it speed up just a bit, while GRAIL B, still out of range, doesn't yet feel the tug. The distance between the two spacecraft increases, and the probes' electronics record the increase, even when the gap widens by no more than the width of a red blood cell. When GRAIL A approaches a crater, by contrast, there's a little less gravity than usual to pull it along. A slows a little, B catches up slightly, and that change is recorded as well. GRAIL B will trail GRAIL A from pole to pole, the pair completing one orbit every two hours as the moon rotates slowly underneath. Over the mission's three-month life span, the twin ships will make three complete gravity maps of the entire lunar globe. But surface features aren't all that the probes will study. There are also regions of higher and lower density buried beneath the lunar surface. These mass concentrations  or mascons  are the likely result of ancient volcanism or ancient impacts. They too exert differing gravitational pulls, with the denser material pulling harder than the less dense, and those differences will be detected by the GRAILs as well. So sensitive are the spacecraft that they will effectively be able to see  gravitationally speaking  all the way down to the lunar core. All these readings will be analyzed along with one other data stream: the slight flexing the entire moon undergoes as a result of the tidal pull of Earth. The nature of the flexing will be partly determined by what the moon's deep structure looks like  whether the core is solid or semisolid or molten, for example. Best of all, there isn't the slightest doubt that this twin-satellite concept can work: it's based on the wildly successful GRACE (Gravity Recovery and Climate Experiment) mission, which has been orbiting Earth since 2002. By noting changes in our planet's gravity, GRACE has, among other things, discovered a giant impact crater underneath the Antarctic ice sheet, measured ice loss in Greenland and Antarctica and noted depletion of groundwater during the recent U.S. drought. If GRAIL does half as well as GRACE  and there's every reason to think it will  the textbooks on selenology, or lunar geology, may have to undergo some major revisions. Finally, it's worth noting yet another thing that makes the GRAIL mission so extraordinarily clever. Rather than take a direct route across the 250,000-mile (400,000 km) Earth-moon gap  a journey that took the Apollo astronauts just three days  GRAIL meandered through space on a loop-the-loop path known as a "weak boundary trajectory" that lasted more than three months, following the path of least resistance through the complex terrain created by the interacting gravitational fields of Earth, the moon and the sun. Going slowly meant not only that the spacecraft needed less fuel but also that engineers had longer to check out the probes' electronic health. 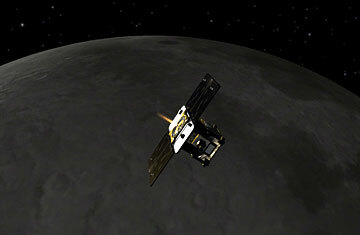 Plus, when GRAIL finally arrived, it took less energy to ease it into a lunar orbit. Back in 1990, just such a weak-stability-boundary trajectory was first used to salvage the Japanese Hiten satellite, which failed in its original attempt to reach the moon and didn't have enough fuel for a second try. In a brilliant bit of cosmic inventiveness, a mathematician turned rocket scientist turned artist named Ed Belbruno calculated a new slow, low-energy route for Hiten and saved the mission. Fortunately, lunar experts, including MIT's Maria Zuber, GRAIL's lead scientist, won't have long to wait for the results of the mission. GRAIL should be all wrapped up by early summer, and by the time the one-year launch anniversary rolls around in September, we should know a lot more about the long and violent history of our nearest, but still largely unknown, cosmic neighbor. See the best photos taken from space in 2011.